Summary: "Dell P2415Q and P2715Q flat panel displays purchased after February 2016 have HDMI 2.0 capability but HDMI 1.4 is enabled by default". HDMI 2.0 capability not enabled by default. High Definition Multimedia Interface (HDMI) version 2.0 provides the user with 4k x 2k resolution capability @60hz for Dell P2415Q and P2715Q flat panel displays. This HDMI 2.0 capability is only available on P2415Q and P2715Q displays sold after February 2016, however HDMI 2.0 is not enabled from the factory. Dell P2415Q and P2715Q flat panel displays purchased before March 2016, only support HDMI 1.4 and provide 4k x 2k (3840 x 2160 pixels) resolution @ 30 Hz using the HDMI cable connection. 4k x 2k @60Hz is available via DisplayPort connection on these displays. How to enable HDMI 2.0 on the version A03 displays. Press and hold the button associated with the Green check mark for 6 to 8 seconds. 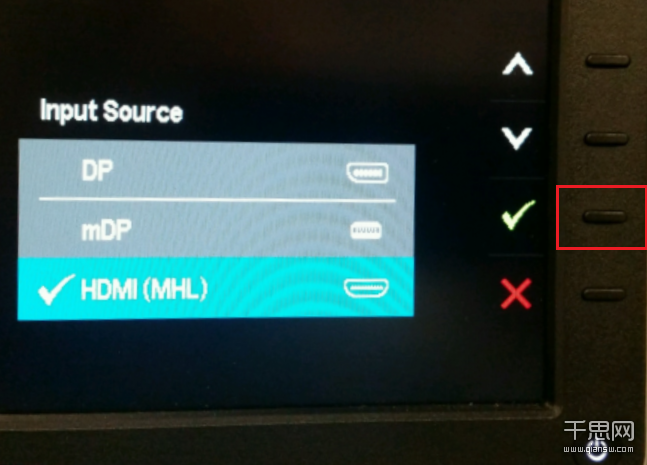 Select the option to Disable HDMI 1.4 support and press the button next to the green check mark to confirm the selection. NOTE: Performing a Factory Reset of the display in the On-Screen Display (OSD) menu (Open the OSD menu by pressing the button above the power button, then arrow down to and select Other, then arrow down to and select Factory Reset), will revert the display back to HDMI 1.4 and this change to HDMI 2.0 will need to be repeated.